Mack-Lite Sword Pinstriping Brushes series M-L by Mack Brush. is the pinstriping brush with "Less Belly" for the pinstripers and sign painters who like that longer hair. Brushes are made out of Blue Squirrel hair. The shape is similar to the "Old Dominican Pinstriping Brush" which was discontinued several years ago. Made with kazan squirrel hair and bound with a brass ferrule. Length out is graduated from 1 5/8' - 2'. Available in sizes 00, 0, 1 and 2. 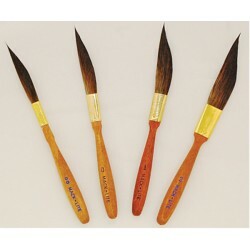 Information and Pricing on the Mack-Lite Sword Pinstriping Brushes series M-L listed below.